Even the insanely expensive soundtrack—speaking of gaudy mash-ups—promised to be huge, betraying a lack of taste and judgment. 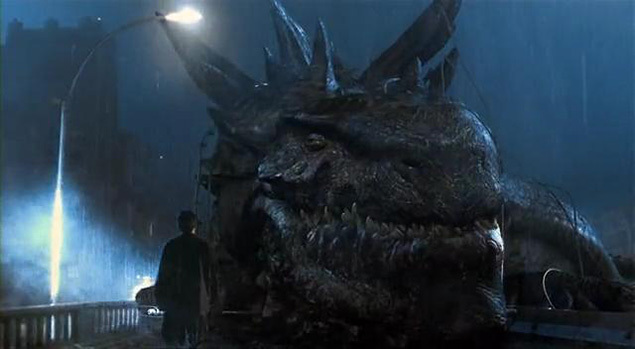 The Godzilla soundtrack features Sean “Puff Daddy” Combs hoarsely shouting over the monster riff from Led Zeppelin’s “Kashmir” on the single “Come With Me”—and since money was no object when it came to Godzilla and its ancillary products, rather than simply sampling Led Zeppelin, the filmmakers threw enough money at Jimmy Page to have him play guitar on the song and in the equally wasteful music video. The soundtrack’s other big single was a food-court-ready cover of David Bowie’s “Heroes” from The Wallflowers, the band fronted by Jakob Dylan, the human incarnation of a mediocre remake of a brilliant, beloved original. In 1998, The Wallflowers were huge, Puff Daddy was huge, the Taco Bell chihuahua was huge (culturally, if not physically), and Godzilla was obnoxiously, oppressively massive. Godzilla was so massive, and inspired such fevered commercial expectations, that the film grossed more than $135 million dollars domestically (good enough to be the ninth top-grossing film of 1998) and close to $400 million dollars internationally, yet was still considered a disappointment. Godzilla was too big to fail, but also too terrible to really succeed. Sony imagined, with good reason, that audiences throughout the world had a Godzilla-sized and -shaped hole in their collective heart, and it was just the studio to fill that hole. It was justified in that feeling. Audiences have long loved the big lizard, despite the often-negligible artistic achievements of the many spin-offs, sequels, and bastardizations that followed the success of 1954’s original Godzilla. Godzilla, along with his occasional adversary King Kong, were childhood cornerstones for multiple generations of film fans and filmmakers, looming large as fantastical, somewhat cheesy figures of fun and escape. 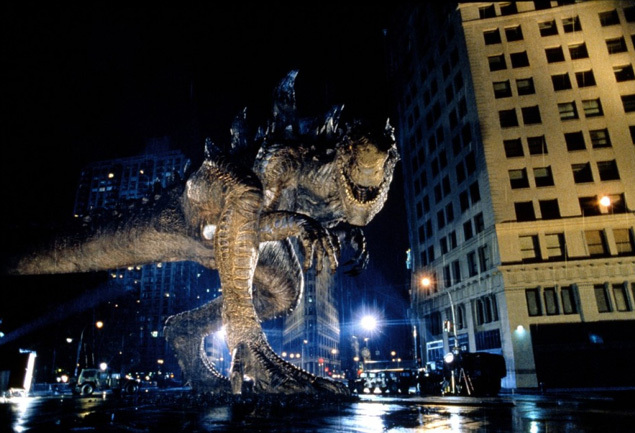 The widely disparaged 1998 Godzilla, co-written by Dean Devlin and director Roland Emmerich, didn’t liberate its title character from the realm of cheese so much as it puffed up the campy elements of the Godzilla mythology to blockbuster proportions. The miscalculation begins with caricatures seemingly left over from a 1970s disaster movie, stock characters who don’t even need to open their mouths for us to know everything about them; their costumes and their jobs define them. Matthew Broderick leads an international cast as Dr. Niko Tatopoulos, a meek scientist sneeringly referred to as a “worm doctor” by his peers. But his worm doctorate lets him figure out that a mysterious creature leaving massive claw prints in Jamaica is actually the first representative of a new species, created partially by nuclear radiation. 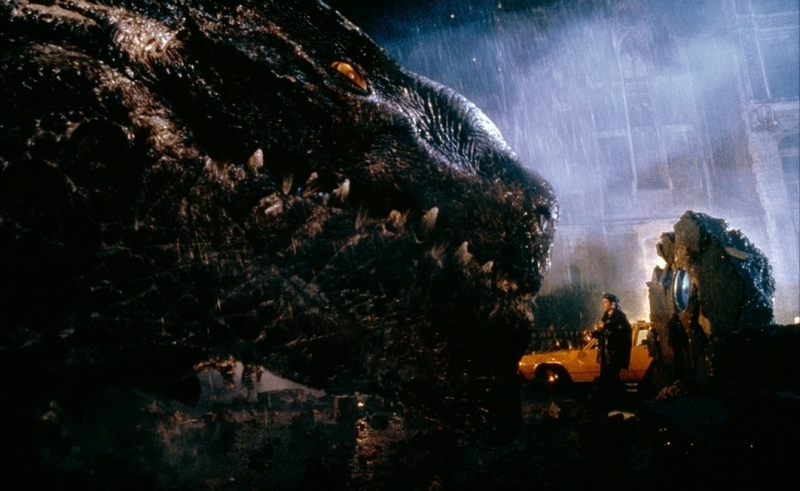 Niko next catches up with Godzilla, the culprit behind the clawprints, in New York, where the creature embarks on a campaign of destruction that prompts corpulent Mayor Ebert (Michael Lerner) to evacuate the city. Mayor Ebert is almost always seen consuming massive quantities of sweets and other foodstuffs, and he’s accompanied by an indignant assistant, a bald man named Gene. In case anyone misses the reference, Mayor Ebert’s mayoral campaign urges voters to give a “Thumbs up for New York.” (Gene clumsily gives his boss and his mayoral campaign a big thumbs down later in the film.) Emmerich and Devlin based their glib caricatures on Roger Ebert and Gene Siskel because the critics had the audacity to suggest that their previous collaborations, Stargate and Independence Day, were less than transcendent. But the way they attack their critics is so clumsy, it suggests the criticisms they resented so much didn’t go far enough. Emmerich doesn’t offer a proper glimpse at Godzilla until deep into the film, but the monster’s effect is felt well before he makes his first proper entrance. That’s a technique that works wonders in Jaws, but is far less effective here. Even before a third-act twist essentially transforms the Godzilla threat into a plague of Jurassic Park-style velociraptors, the film is shameless in its aping of Steven Spielberg. More than once, Emmerich borrows Spielberg’s signature shot of a group of people looking into the distance and trembling with awe as they contemplate something beyond the limits of their imagination. But these sequences fall flat, because the film does not earn a Spielbergian sense of wonder. The human stick figures who populate Godzilla are not encountering an instantly unforgettable character like Jaws, E.T., or the dinosaurs of Jurassic Park; they’re confronting a jumble of zeros and ones that computer technicians designed to resemble a strange, unsatisfying cross between a giant iguana, the xenomorph from Alien, and a super-sized velociraptor. Emmerich’s Godzilla has no personality. He isn’t the heartbreakingly human ape created by Peter Jackson and Andy Serkis for 2005’s King Kong, a film that only benefits from comparisons to Emmerich’s boondoggle. He isn’t the otherworldly threat of the 1954 original. There is no gravity, no substance, no physical weight to the creature as it races across the city, flattening everything in its path. This Godzilla only looks like the combined labor of hundreds of bored computer animators and CGI specialists typing code into laptops until carpal tunnel syndrome sets in. 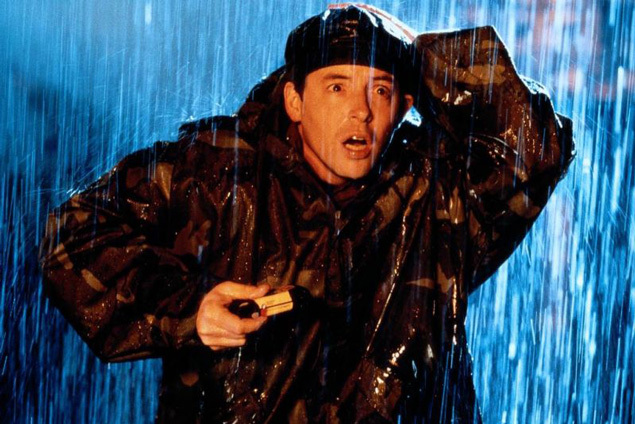 Godzilla’s tour through New York reconnects Niko with ex-girlfriend Audrey (Maria Pitillo, in the role that launched her to anonymity), a plucky reporter chafing at having to work under pompous, backstabbing anchor Charles Caiman (Harry Shearer). In the Godzilla attacks, Audrey finds a vehicle to reignite her dormant love affair with Niko and score the big story that will let her escape the shadow of her creepy boss and make her career as a hard-hitting chronicler of giant monster strikes. Godzilla consequently doubles as an epic action-adventure and the tale of how a generic blonde New Yorker achieved self-actualization and realized her goals with the help of a giant radioactive lizard. Godzilla arrived at a curious cultural crossroads. The Cold War had ended years earlier, and with it, the looming threat of mutually assured nuclear destruction that gave Godzilla its allegorical punch. And 9/11 hadn’t happened yet, so it was entirely possible for a massive destructive force to attack New York City, destroy famous buildings like a kid crushing Coke cans, and leave a massive pile of destruction in its wake without invoking memories of the attacks on the World Trade Center. Even viewed now, Godzilla has shockingly little contemporary resonance, because it doesn’t really take place in New York. The city it inhabits is a product of backlots, sound stages, and CGI, but it is most assuredly not the real New York where people live, work, and die. Godzilla is so divorced from even the fuzziest connection to reality that no real-world tragedy can penetrate its cartoon bubble of juvenile idiocy. This should be a terrifying moment: We’re now faced with an extinction-level event, not the mere trampling of the eastern seaboard. Instead, this revelation triggers the grim realization that this foolishness is doomed to go on for at least another half-hour. Godzilla boasts three distinct, and distinctly unsatisfying, endings. The first two disappoint in part because they don’t actually bring this monstrosity to a close, but instead prolong the proceedings until the film feels unmistakably like a dreadful revamp of a beloved monster and its unnecessary sequel. Once the heroes discover the multitude of Godzilla eggs deep within Madison Square Garden, the film devolves into a particularly shameless knock-off of Jurassic Park, with Godzilla’s babies taking the place of the fiendishly intelligent velociraptors of Spielberg’s film. Alas, in the five years since Jurassic Park dazzled the world and illustrated the creative and commercial capabilities of computer-generated imagery, the technology had evolved so dramatically that the fantastical—realistic dinosaur monsters that dazzle the eye and fool the imagination—not only became possible, it became boring. CGI is ultimately just a tool. Like any tool, it can be used for good or evil, to create masterpieces or waste everyone’s time. In the hands of an artists like Spielberg or Jackson, it can yield wonders. In the hands of Emmerich and Devlin, it’s a lazy crutch to overcompensate for weak storytelling and cardboard characters. Godzilla isn’t just less frightening than Jurassic Park, it’s also less frightening than the “Weird Al” Yankovic song of the same name. In a live report from Madison Square Garden that seemingly seals Audrey’s rapid ascent up the journalistic ladder—because what is Godzilla, ultimately, if not the plucky tale of an ambitious journalist cruelly denied opportunities, waylaid by some nonsense involving an oversized, outraged iguana-monster?—Niko warns that if the creatures escape and survive, the future of humanity will be at stake. But he must be on some really amazing tranquilizers, because he doesn’t seem particularly concerned. And if the milquetoast hero of Godzilla doesn’t much worry about baby Godzillas rampaging throughout the world, then why should the audience? The military blows up Madison Square Garden but good, seemingly ending the threat posed by Godzilla and all the mini-Godzillas, while miraculously sparing Niko, Audrey, Roache, and Animal, all of whom survive for the sequel that thankfully never arrived. Alas, this is a false ending as well, as Godzilla roars out of the deep after a long, restorative nap, with vengeance on his mind. He then sets about terrorizing the greater New York area one final time. Godzilla attains a single fleeting moment of grace when Godzilla finally, conclusively perishes (for real, this time), and not just because it finally brings this disaster to a merciful close. The mighty creature’s eyes close, and a film that’s been screamingly loud and obnoxious for nearly two and a half interminable hours becomes blessedly quiet. It’s too late, however, as the 1998 Godzilla had already squandered the public’s seemingly boundless goodwill for its subject. Godzilla’s simultaneously impressive and disappointing performance at the box office proves that size does matter: It’s impossible to imagine a much smaller film grossing nearly $400 million worldwide despite seemingly universal disdain. The filmmakers’ fatal mistake here lies in thinking that size was the only thing that mattered. With luck, Gareth Edwards’ apparently serious-minded 2014 reboot of Godzilla—which will once again set out to fill the Godzilla-sized and -shaped hole in the public’s collective heart—doesn’t make the same mistake.